The past two weeks have been riddled with sickness- when either my partner, Sarah, or I become ill, both of our schedules are affected. However, we truly thank God for the powerful ways He's been at work in Kabale, through sickness and many changed plans. On the first of November, the agriculture department of PAG Community Development had an in-depth monitoring of both its strengths and weaknesses. Together with all the board members, including the bishop and our village church pastor, we visited three gardens to get a glimpse at the work the Ag department has done since they were last evaluated. When we returned, we spent the next few hours discussing our observation of each garden, including some demonstration gardens in villages, and recommendations for future work. As part of our shared learning experience, Sarah and I will be observing other branches within the Community Development Department, or CDD. Our first visit outside of Agriculture was with our Livelihood department coordinator, Mable, who is the wife of our pastor at Rwakaraba PAG church. Yesterday, we drove to the neighboring village of Kitumba again, but this time to meet with a group of farmers who began their journey of saving and promoting healthy lifestyles back in 2006. Sarah, Mable and I, with their group leader, Willy, discussed some issues concerning nutrition, health and hygiene before moving to our main topic of group enterprises. 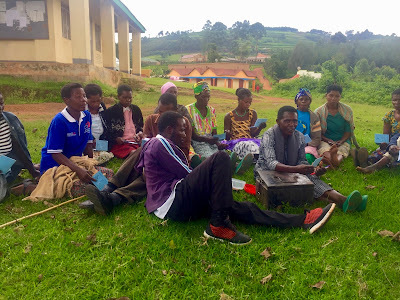 Together we discussed the VSL, or Village Savings and Loan, association and promoted the idea of having their group not just save, but implement a project that benefits the group as a whole. The group started out as a group of HIV+ people 11 years ago with goals to improve health and well-being for those living as HIV+, promote income-generating activities, and provide counseling and opportunities to share life experiences. When PAG CDD targeted them for savings through borrowing, raising and selling goats and pigs, they found they had a fundamental problem: How do the animals benefit the whole group instead of just the individual? As a result, they registered their group with the PAG Sacco (aka Savings and Credit Cooperative Organization) in Kabale and had goats, pigs and rabbits to keep, as well as a smaller committee to monitor how the animals are being cared for and their farming practices. We discussed a strategy to benefit the entirety of the farmers and their future with the animals: first, give two pigs out of, for example, eight total to group members who have never received animals from the PAG sacco before. Then sell one from the six left and put the money in the group savings. The Livelihood department coordinator told all of us that the VSL group in Kitumba was a model example for many reasons, but principally for their dedication to save money and invest in resources that will benefit the group and individual lives in the long run, not just an immediate gratification. A prime example is a woman named Prudence. After finding out she was HIV+, she met Willy, the leader of the VSL group, and he encouraged her to join and start saving her money. She borrowed 100,000 shillings, approximately $27, and planted cabbages. After selling her cabbages, she now had 1.8 million shillings, approximately $495! Because of her investments in the sacco, she was able to buy 3 plots of land and create an Irish potato and cabbage-selling business from it. She was also able to build an extension to her previously crowded home which we were able to visit and see tangible differences in. She is praying that God bless her brick business and make her dream to have a more permanent home made from brick built come true. On Wednesday evening, our home cell (the group of people in the Rwakaraba PAG Church who meet in a home during the week to fellowship) decided to visit the home of an elderly woman named Eileen. Eileen is HIV+ and was struck by high blood pressure years ago and had a serious stroke. She has been paralyzed on the entire left side of her body ever since. Her neighbors nor her grandson visit often enough for her to have decent meals 2-3 times every day, bathe herself, or clean her clay home. Our group of 7 members surprised her with some food and love this evening, and she was overjoyed that we had found her home tucked away behind the main streets of Kabale. Before we began anything, we prayed over her body and health, and worshipped our Father. We spent the evening cleaning her home and washing her bed coverings while she sat on a bench and looked outside after years of seeing only her walls. We are praying and believing that she will one day be able to worship with us at church with legs that have been healed! As we plan for a busy few weeks ahead, with an evangelism outreach crusade and holidays in the mix, please keep Prudence, Eileen, the town of Kabale, and the PAG church in your prayers! What a wonderful adventure and such an important mission - you are blessed (and we are too) for serving there. The view beyond the people in that picture is great - take more pictures of your environment. I'd like to see what "downtown" Kabale looks like!